Lingana Fort is in Mahad Taluka of Raigad District. It is 202 kms and 140 kms away from Mumbai and Pune respectively. The trek to Lingana Fort is one of a kind. It consists of Rock Patches post reaching the ridge of Lingana and Railingi Pathar. This fort was mainly used as a Jail for the Prisoners of the bygone era. Grain Store or Kothi Ghar and Water Cisterns was built only to keep the prisoners alive. Post visiting you will understand why it was built as a Jail. 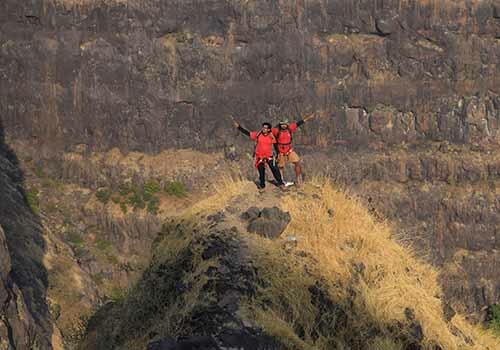 From top of Lingana one can view Raigad Fort, Torna Fort, Railingi Pathar/ Plateau and glimpses of Rajgad Fort. Best Time to Visit – Winter Season is the best to visit this Fort. Imp Note: Not advisable for first timers. Meeting Point: Near Pritam Hotel, Dadar (E). Meet at Dadar Railway Station (E) near Pritam Hotel at 11:45 pm. We will travel in a Non-AC Private Bus to Pane which is the base village of Lingana. 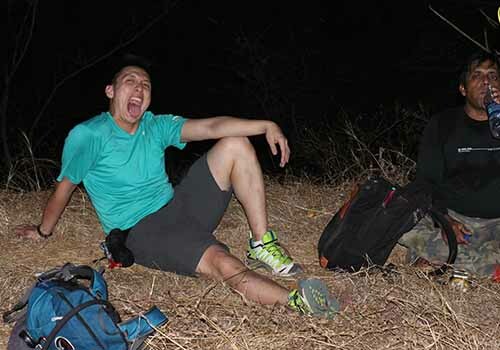 We will reach Pane village around 5 am in the morning. Freshen up and fill your stomach with the simple and healthy breakfast. 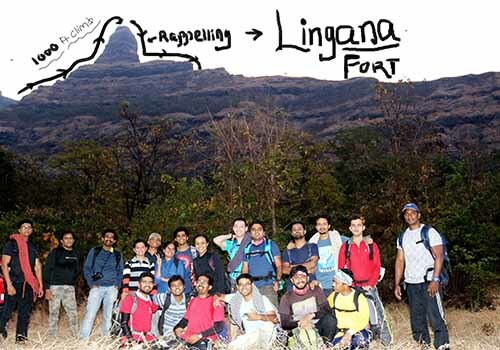 Start the trek to Lingana fort around 6:30 am after a brief session of Introduction and Instructions. 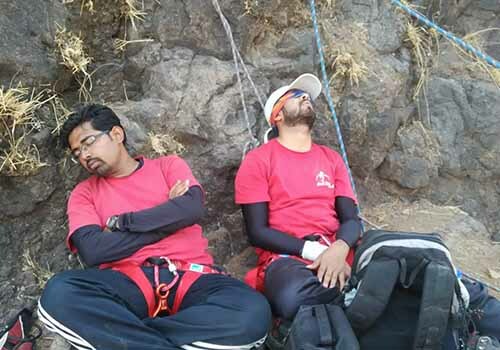 It will take around 2 – 3 hours to reach the first rock patch where you need to climb to head further. Before climbing up listen and follow the instructions of the Guide. Do not hesitate to ask your doubts. Head further ahead to reach the second patch of Rock Climb. Show off your skills again while climbing the rock patch as you did earlier. We will reach caves after the rock climbing session. We will rest for the day at the caves. Enjoy the Packed Lunch at the caves and dinner will be prepared in the caves in the evening. Wake up around 5 in the morning. 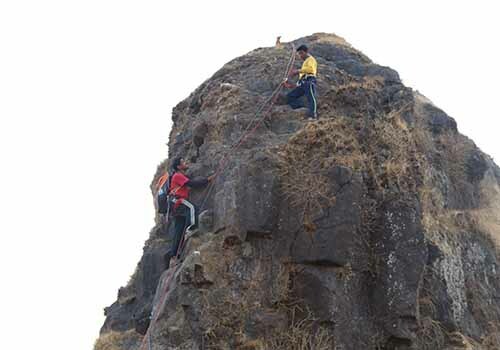 Enjoy the packed breakfast and head for the 3rd patch of Rock Climbing. Listen to the instructions of the Guide carefully before you begin Rock Climbing. Start the Adventure of Rock Climbing one by one. Post climbing the rock patch, head further to reach the top. Enjoy the 360-degree view from the top. 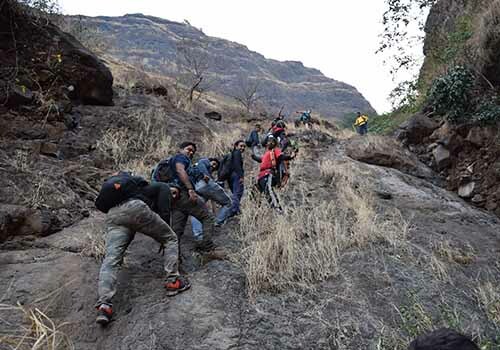 Test you eye to identify the nearby forts namely Raigad, Torna and glimpses of Rajgad. We will start Rappelling after 30 minutes. Begin the Rappelling session one by one and reach the base village around 2 in the afternoon. Enjoy the lunch at base village and head back to Mumbai by 3:30 pm. Please do share your experience and feedback on the way back. ● Any other charges not specifically mention in “Cost includes”. ● Please carry a small bag which we use while climbing to carry food & water only. ● ID proof, 4 ltr water must, Torch with extra batteries (Compulsory). ● Please wear good trekking / Climbing shoe. ● Full sleeve shirt/T-shirt & Full Pant, Cap. ● If you have any medical issue please carry your own medicine as we carry only First aid.